As you probably know, the first versions of this generator were a small exercise in procedural generation without much purpose (here is my first post about it and the earliest screenshots). Over time it has found its audience of users, which affected the direction of development and made the whole activity much more rewarding - thank you all who supported the project and provided much-valued feedback! The time has come to decide how it’s going to be developed in future. To implement all the requested feature (or at least the good part of them) and to keep myself motivated I’m considering shifting the focus of development from the current online generator to a new paid desktop application with much richer editing and customising capabilities. And before anybody asks: the online generator will stay where it is and how it is now - i.e. free (I will tell about it in a little more detail below). Things in this category are the most interesting for me to implement and probably the hardest as well. Better rivers with support of multiple channels per map, tributaries and looped channels (e.g. moats). More diverse landmasses' shapes with support of islands. More flexibility in castle placement: within city walls, outside city walls, multiple castles per map. Support for multiple sets of city walls, both nested and independent. Better streets and alleys - more diverse and natural-looking layouts. More love for extramural farms. Initially the goal of the generator was to produce reasonably believable maps with a single click. It changed over time, now it’s possible to customise cities to some extent and reroll individual wards. In the next update of the online generator a “warp tool” will be introduced, but I’m not going to push it any further, proper editing will be added to the desktop application only. Saving and restoring edited maps. Improved warp tool with undo history, “liquify”, “bloat”, “pucker” modes. Topography editor for manual marking (drawing) land, water, city and other types of map regions. Topology editor for editing roads and channels. Customisable list of wards with arbitrary names, layout settings and placement rules. Automatic POI generation - taverns, shops, local temples etc. Maybe the name of this category is not perfect. It’s about visual things, which may be present on a map, but do not affect its structure. Marking individual buildings with icons, labels, colours, and descriptions. Marking individual wards for highlighting and overriding automatically created labels. Marking freeform areas - large neighbourhoods, bays, city surroundings etc. Marking streets, roads and channels. Name generator for all kinds of toponyms. Map decorations: titles, borders, legends, coats of arms etc. For making a better 3d-visualiser than the existing standalone ToyTown, I’ll probably switch to Unity3D or UE4. Better render quality (AO, shadows, depth of view etc) and performance. More architectural diversity (roof types, chimneys, jetties etc) and slightly higher level of detail, although I’m planning to stick to low-poly aesthetics. Stylised rendering to produce more artistic-looking maps similar to the image above (another example). Physics (or just collision detection) for comfortable model exploring. Elevation support - hills, hollows etc. Customisable colour, light and atmosphere settings. As you can see this is a long list and a lot of work to do. So I am going to undertake it only if I’m sure that it is needed. Maybe I’ll try to run a small crowdfunding campaign to verify it. If there will be an app, what is going to happen to the online generator? As I said before the online generator will continue to exist as a free “click to generate” thing. I will keep updating it with features from the app which are easy to transfer, mostly the ones from the “Layout” category. Probably I’ll try to integrate ToyTown into it, although I’m not happy with its performance at all. The next update will be released tomorrow. If there won’t be an app, then what? Even if there won’t be an app I’ll keep updating the online generator, just not as often - depending on my interest and amount of free time available. Easy to do things will be prioritised. Just found you and already supported your work. Keep it going. It all sounds really good. Can't wait to see where this goes. Where can I download MFCG for my computer? Thanks. I am in, so take my money to support you with a desktop app. yeah I think this is grand. if you need support via cash or the like. I'll happily donate for such a project. Yes, I'm definitely on board with all of this, sounds great! I do love a good detailed, editable generator, and I've already gotten such good use out of the online version alone. Looking forward to this. Very much on board. The only other thing that I'd maybe ask for in a paid standalone app is addition/deletion of vertices if that's not already in consideration. You should consider having an export data open standard file format (like in json) or something that developers can use to load the map and add their own "enhancements" over it. The voronoi structure/neighbours, etc. Though i think re-coding stuff to Unity asset would be better for Unity users as well, since it comes bundled with all the physics and such. Can try the C# export in haxe for the engine-agnostic codebase. For a 3d collision detection , Bounding Volume hierachies (BVH) would be a good approach to narrow down on specific potential geometry to test against instead of testing against the entire 3d model (ie. narrow down to specific bounding box leaf which a conservative coarse sweep velocity volume intersects with..). I didn't convert it to a HAxe generic yet though. Woudl likely need to replace the proxy:T to a generic data type, and converting it to haxe should be pretty trivial. This is the best for Dungeons and Dragons and a mobile app. I would be happy to contribute to crowdfunding if that becomes a thing! First, I love your on-line version, it's great. I came here to specifically request a Desktop App that I could purchase, but it looks like you're already on that path. Thank you, this is something that I, and many other gamers, have a tremendous use for. 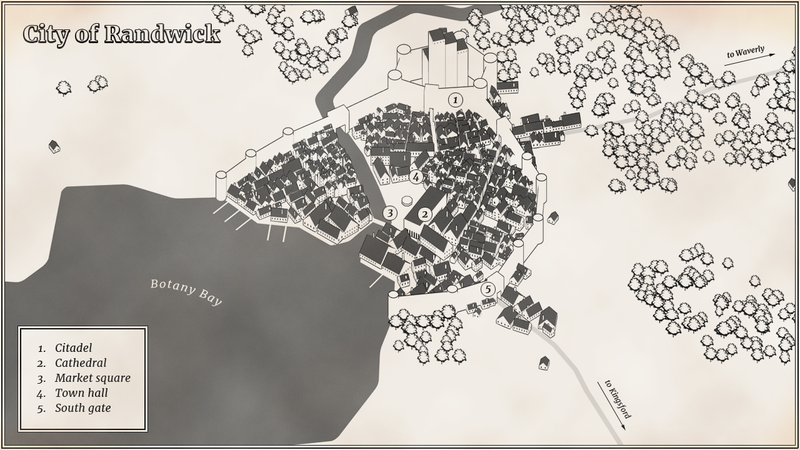 One of the things you didn't mention, but would be very nice too, would be to include a demographics generator that would show the population based on the size of the city and a selectable 'Population Density', then list the number of each type of establishment to be found in the city of various types (taverns, cobblers, armorers, swordsmiths, tailors, etc). There are a number of "Medieval Demographics Generators" out there which produce this sort of info, but it was be perfect to integrate it with an actual map that showed distance scale. A possibility is to release what you have as a Desktop App to be paid for, then perhaps, let people pay more for each upgrade. Kickstarter works great too, though. Count me in! Once you are ready to release the Desktop App, an important place to sell it from is 'DriveThruRPG.com' and 'RPGNow.com', where it will reach a huge audience of people who will want it and can purchase it. I definitely support this if you launch it for founding, I will use a lot the 3D exporter to SketchUp and make some renders, (or I will pay for the desktop app ) either way it's an amazing tool! I would pay for this as is. If you can add more features, and keep it "abstract" enough to be used for both fantasy and sci-fi, I will happily pay for the next version. Meanwhile, if you can spin off a project that takes manually drawn polygons (such as a building copied from this map) and fills in a procedural floor plan, that would also be amazing. I don't know about sci-fi, but I do want to keep it abstract. The standalone generator would expose much more settings, hopefully they will be enough to create more diverse maps. for more 'high-tech' settings, railroads? either passing through, terminating/beginning at, or otherwise? It would be great if this paid version could also run "unassisted" as a script, with some option and even a random seed specified by you.